Last September I had to have my hip replaced. I became a fully fledged bionic woman. I’m like 60% metal parts these days. You can read about the why’s and where’s in this post https://estellosaurus.com/2016/10/06/total-hip-replacement-my-surgery-experience/ It was a long recovery and at my 12 week review my consultant suggested a course of Physiotherapy, they were concerned about some muscle weakness I had, although to be honest no one really knew whether or not this was caused by my lack of movement following the replacement or if it was just another quirk of my disability. I’d also been having a bit of pain in my new hip, the most irritating of which felt like I was sitting on a cricket ball all the time. If I’m honest, I was a bit dubious at the prospect of physiotherapy. 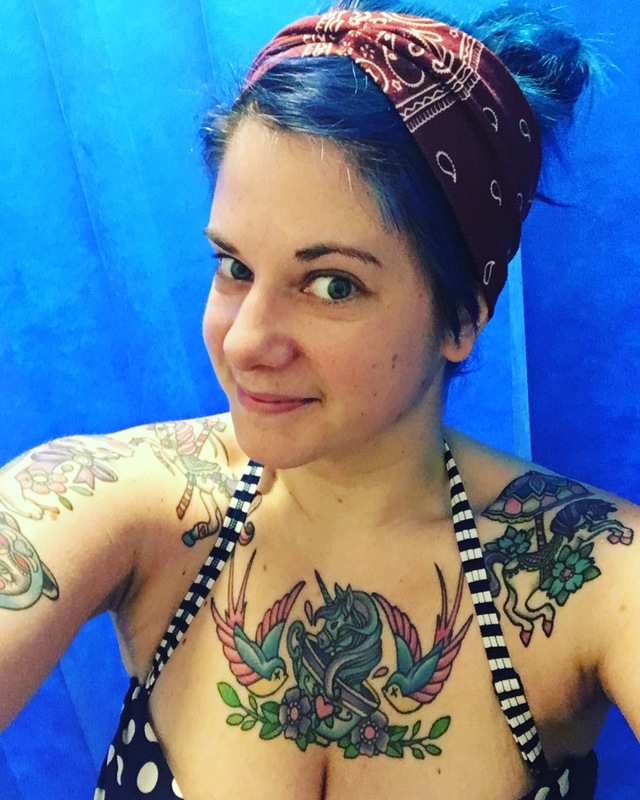 I’ve had a few sessions over the years and never really felt much benefit from them, I also had taken a bit of a dislike to the physiotherapists on the ward whilst I was an inpatient following my hip surgery. My physiotherapy referral came through quite quickly and less than a fortnight after I was referred I had an appointment to see the a physiotherapist at my local hospital. My physiotherapist was a very nice man, who put me at ease immediately, we had a brief consultation and he asked me ALOT of questions, ranging from how well I slept, where my pain was, and what medications I was on, to questions about how active I was and if I’d had any unexplained weight loss. He then proceeded to poke and pull at me and I had an examination. He concluded from this that my hip pain was muscle pain rather than an issue with my brand new bionic hip. I can’t tell you what a relief that was as I’d already convinced myself at various times in the early hours of the morning that my body was rejecting my new hip! The physiotherapist recommended that I should undergo a course of Hydrotherapy sessions, he thought it would help with my hip pain, the muscle weakness and as an added bonus he thought it may help with my inability to sleep and my anxieties. He made an appointment for my first session a week later. Hydrotherapy is a basically another form of physiotherapy where specific exercises are carried out in a purpose-built warm pool that is kept between 35.5 and 37 degrees. Throughout history, water therapy has been promoted for having excellent health benefits – think Roman baths! 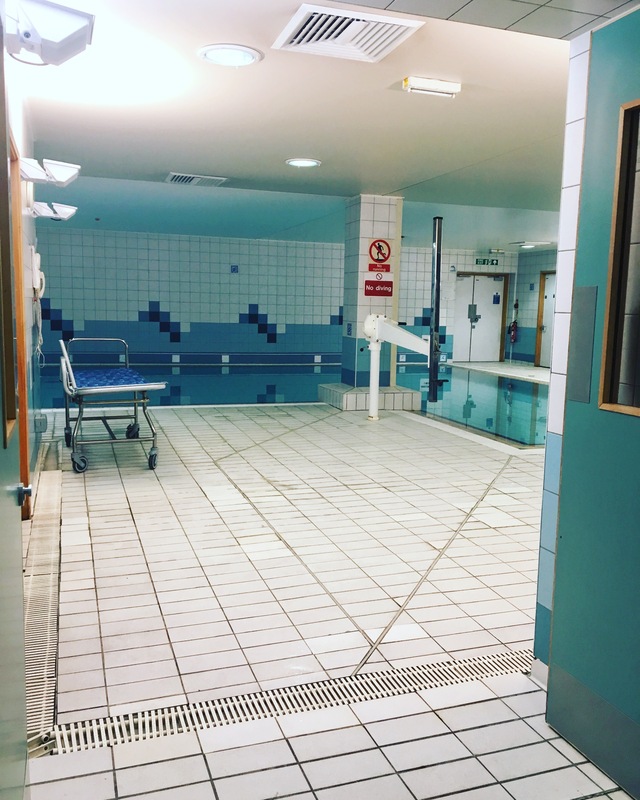 The benefits of hydrotherapy can include the warm water helping your muscles relax which can ease pain and make exercise a lot easier, the water helps to support your body weight which reduces pain and relieves the stress on your joints, it can also help to improve circulation and reduce swelling in joints. It is recommended for a number of conditions including Low Back Pain, Rheumatoid Arthritis and Orthopaedic surgery / breaks and fractures. I was pretty anxious in the lead up to my first session. I don’t always do well with unknown situations and I also can’t swim that well, so I was pretty concerned that I might drown. I was able to do a little online research and my local hospital had a webpage with some details and a picture of the pool which I found quite helpful. I arrived for my first session and was given a laminated information sheet which gave me lots of details such as details about the changing rooms and some other bits and pieces. I was also shown around the unit, they also reminded me to make sure I pulled the curtains round in the changing rooms as even though it was an unwritten rule – ladies on the left, men on the right. Occasionally you might find someone has swapped over! You also get to use a locker which they advised me didn’t lock so I could either bring my own padlock or hand valuables into the reception. You get ticked in by the hydrotherapy instructor and you go and get changed. For my first few sessions I was still on crutches and I was asked to use a wheeled frame that they had provided round the pool. I was told to shower without soap on my way into the pool and with soap after the session ended to wash the chlorine off my body. There were around 8 or so other people (men and women) there, all having a session at the same time. The pool itself is a decent size, the most people at one of my sessions was 12 and that was a bit of a squeeze as you need space around you to do the exercises. The pool has big, wide steps into it with a handrail on either side so it’s pretty easy to get into. There is also a hoist on the side of the pool so they were able to hoist people in and out as well if they couldn’t manage the stairs. The pool also has a hand rail the whole way around so if you are a bit unsteady like me, so can feel pretty safe making your way around the pool edge. Generally, everyone did the session around the edge of the pool holding onto the rail. I was pretty worried about my swimming abilities but as it was, the pool at it’s deepest only came up to my shoulders (I’m a massive 5ft nothing). So I didn’t need to worry about drowning or sharks in the pool. My first session was pretty simple. I was given 6 warm up exercises that I had to do 30 of each. That was all I did on the first session and although it doesn’t sound like much, it really exhausted me. I’d basically done nothing for months so this exercise which felt gentle and easy in the pool made me ache for the next day or so. I booked my next few sessions – the hydrotherapist suggests to each person when and how many per week they should book. My second session was much of the same. I started with the 6 warm up exercises and then started a new one – I was given one of those pool noodles that the hydrotherapist folded in half and I had to place one foot in the middle of it. I then had to do 30 knee raises with one hand holding the rail. I then turned to face the other way placing the other foot onto the noodle and repeating the exercise. If I felt up to it, I was able to do another 30 on each leg. These feel great – you get such a good stretch and the floating abilities of the pool noodle help to lift your leg up without putting too much pressure or strain onto your muscles. The next few sessions carried on like this, I built up the amount of warm up exercises over the next few weeks as well as building up the amount I did with the pool noodle. By week 4 I was doing 40 of each warm up and 60 with the leg lifts. Week 5 and I dropped back to 30 warm ups – I suspect this is more to do with how much time you get in the session, the more warm ups you do, the less stretches and other things you have time for. Week 5 I added in a new exercise, I had to have a small rubber ring on my ankle and then lift my leg out straight to the side, a knee left and then straight in front. I had to do 5 each of these with my new hip and 3 on the other side. The week after we added another new exercise which I found incredibly difficult. I had an arm band placed over each foot and I had to do small, but quick movements, bringing my ankle (with my leg straight) out to the side a few inches and then back next to my other ankle. I really struggled with this one and only managed 5 on each side that first time. By week 8 I was practically a veteran. I was doing 30 of each warm up exercises, 2 sets of 80 leg lifts with the pool noodle on each leg, followed by 40 of each leg stretch with the rubber ring and the horrible one with the arm bands 10 times with each leg. Week 8 was my last week and I was referred back to my physiotherapist. 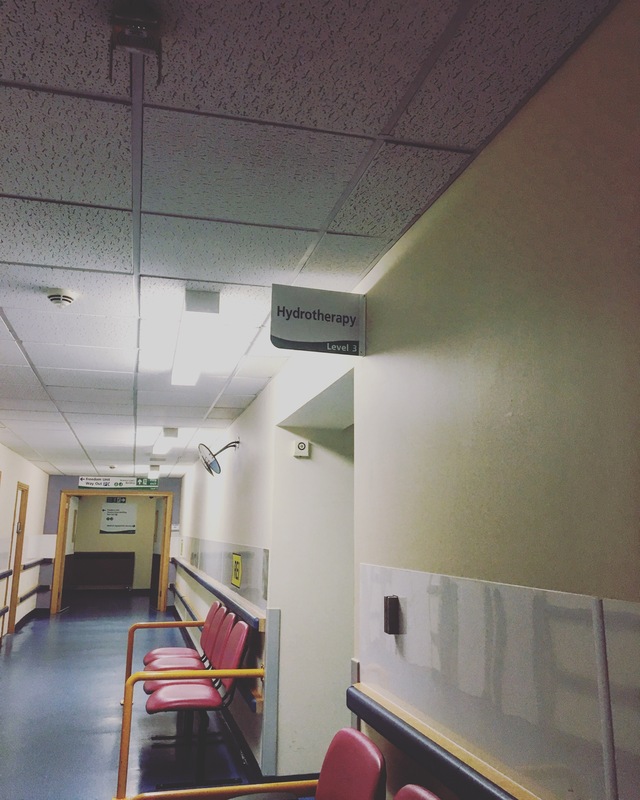 Generally, in my local NHS you are only allowed 8 hydrotherapy sessions. Apparently the demand is so great that 8 sessions is really the maximum they can offer. The pool in my local hospital does offer extra sessions one afternoon a week at a cost of around £44.00 for 6 sessions. They are however unguided and there is only someone available in an emergency, i.e. no instructor will guide you through the session. I found the hydrotherapy incredibly beneficial. Each time I got into the pool, the heat of the water literally melted away my anxiety, stress and pain. After just a few sessions I felt an improvement in my pain and my tolerance for being able to stand and walk for long periods was improved too! By my final week, I was feeling much better, the sitting-on-a-cricket ball pain had gone too which I was thrilled about. The other people on my sessions attended for a variety of reasons, some recovering from orthopaedic procedures like me, other with neck, back and other joint pains, one lady I spoke to suffered from Fibromyalgia and there were a couple of gentlemen who had suffered strokes and were using hydrotherapy to build up some strength in their muscles. The instructor was really nice, chatty and helpful. He was really good at putting you at ease which certainly helped. He explained and demonstrated each exercise clearly and made sure that I was able to follow the exercise before moving onto help someone else. My time in the pool was at it’s longest around 40 minutes. My hydrotherapist seemed to spend all day in the pool and I never plucked up the courage to enquire if he looked like a big raisin at the end of the day. It occurred to me on more than one occasion as I caught a glimpse of my reflection in the glass of the reception window that I am no Ursula Andress and I do not leave a pool gracefully. I personally found the flooring difficult to walk on but I’m very unsteady on my bare feet anyway, I had access to a wheeled frame should I have felt really unsteady. I’ve since been back to dry land physiotherapy and have been discharged from the service. I was given a 12 week open ended appointment should I feel I need input from the physio department during that time. I have started to notice some pain and stiffness creeping back into my new hip and I am trying to find a new and quiet pool that I can use to keep up with the exercises I was given. I am really keen not to undo the good work from my hydrotherapy sessions. I would definitely recommend a course of hydrotherapy if you are offered one. I really enjoyed the sessions I had and they definitely improved my mobility and helped me to recover even further from my surgery!